I was aboard a Virgin Atlantic flight about 2 years ago and I saw the Jawbone UP in the in-flight brochure. What an UP was, simply didn’t register in my mind. I was diagnosed as an athlete 20 years ago, which totally surprised me! However, I did take great pleasure in producing a print-out from St Thomas’ Hospital to show my Basketball teammates, who were half my age. Every time they made a wise crack about my age, out would come the report and I would openly gloat “cos I’m an athlete, you know” . I retired from my active Basketball participation in 1998 and if I was honest, I have proceeded to get sick ever since. 20 years ago I was diagnosed with Hypercholesterolemia, which was why I attending St Thomas’ Hospital. By July 1st, this year, my weight had climbed in excess of 252lbs but my cholesterol level remained static at around 11. Some time back I decided to quit the Statins and all the other drugs that had been prescribed to fix my Cholesterol and I am glad I did! Last year the film ‘Statin Nation’ was released, which refutes that Cholesterol is the killer that it is reported to be and that “People with high cholesterol tend to live longer” . The purpose of Cholesterol it seems is to repair damage to arteries, Cholesterol is not the problem, it is a symptom of something else and the wrong thing is being treated. “Is my life going to be about taking drugs?”. It was a Brain Space thing. I consider my present time and where I put my thoughts as precious, even more than my own longevity. Worrying about taking prescribed medications wasn’t doing it for me. As my weight grew so did my blood pressure. It was high! Walking up slopes for any amount of time produced tightness in my chest, I was aware of pains in my shoulders, tingling hands and even my teeth experienced strange sensations! Last year my friend , Jason Jackman, referred to me to Superwellness Nutritionist Coach, Angela Steel and my education began. Sweet! Its everywhere! From bread to Coca Cola, from ice-cream to ketchup, from hot-dog to cakes, jams, sweets, sausages, yoghurt … you name it! In virtually everything I ate. My eating habits changed and I discovered just how enjoyable AND SATISFYING some foods really are, yet alone how they repair my body! 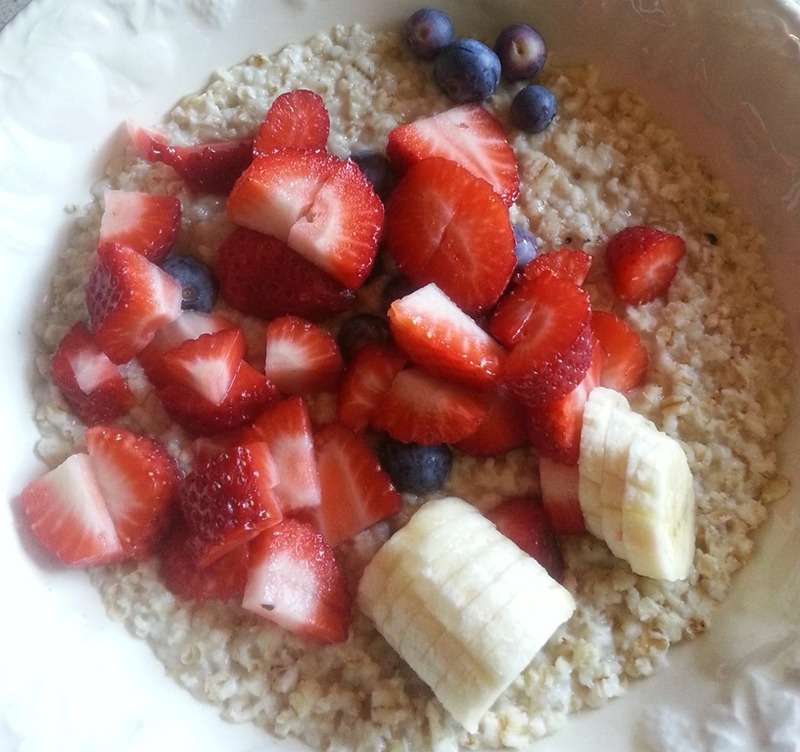 Organic oats for breakfast with Strawberries and Blueberries and half a banana – even though the banana has natural sugar, it still has sugar! Snacks of Almonds or Munchy Seeds – new sensations, new tastes – its all new experience and its fun! This year, I re-mortgaged my house and a medical report was required by the insurance company. Blood tests were taken and submitted to my Doctor and off I went to see him. My visits to the doctor occur about every 10 years. He said “your Cholesterol level is 11”, I said “that’s good for me”. We discussed how to lower it and given my decision not to take drugs, I asked what the alternatives were, expecting him to talk to me about food or alternative therapies. Instead I was offered alternative drugs. The UP wristband tracks the amount of steps that I take and sleep states, deep and shallow. I then plug it into my Android phone and it uploads its data to the UP app. It is like a life journal. I also push data from the UP app to Facebook, Google Docs and Google Calendar. I then discovered the Withings Smart Body Analyser (scales) which feeds my weight, Body fat measurement, CO2 readings from where I sleep and my heart rate thru WiFi to its app and from there to most of the other Life-style apps that I now use. If any of the apps don’t redistribute data to other apps, then usually IFTTT.com can. The Runkeeper app measures my steps, tracks me by GPS and tells me (in a female voice) how I am progressing as I walk. She tells me about my pace and speed. Runkeeper is another app installed on my smartphone too. All that remained was to monitor my heart rate on a continuous basis and upload that data to my phone and there I hit a problem! According to Polar, in the UK, Polar Bluetooth Heart Rate Monitors don’t work with my Samsung S3! In point of fact nothing seemed to work the way I wanted but if I owned an iPhone, I would have been spoilt for choice. I think that is pretty backward! Eventually, I bought a Garmin Forerunner 110. Although this doesn’t transfer data by Bluetooth or WiFi, it connects via a USB directly to my laptop and using Runkeeper,com, I can upload a map of where I walk, the elevation, my pace etc. etc., as well as to Garmin Connect which records the same data and keeps a record of my activity on its own calendar. Garmin also has an app for my phone. So I bought the same Juicer, as he uses in the programme. then I needed to measure the acid in my blood and that where it becomes lo-tech. The great thing is that I dropped 10lbs in a week. I feel so great and its getting better each day! And everything is broadcastable through Facebook and Twitter and on Runkeeper’s own Social stream – that’s quite an incentive! Becoming accountable to my network and even having one of my clients who monitors me, which she does admirably! So, the Universe conspired to get me well. I got aware and I have had a fun time playing with gadgets and apps and being a ‘Social Tart’, enjoying reporting the progress in ‘SoMe’ and all this while I heal …. Fabulous! This entry was posted in 2013, Article, Blog and tagged apps, aptitude, Health, juice, Life, Social Media, Universe by AyPee. Bookmark the permalink.